Brandy Vann started over in a new organization in spring 1991. He also wasn't intimidated, according to The Milwaukee Sentinel. It was Vann's sixth professional season and he was hoping to move up, he told The Sentinel. "I've tried to go out and pitch and not worry about everything," Vann told The Sentinel. "I feel I belong. I just want to try to not overthrow - just pitch like I can pitch." Vann first made AA the previous season in the Angels system. He returned to AA with the Brewers in 1991, but also got time at high-A. He didn't make AAA for another two seasons. He never made the majors. 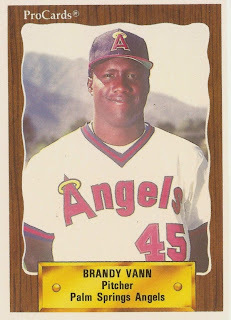 Vann's career began in 1986, taken by the Angels in the first round of the January draft out of Butler County Community College in Oklahoma. Vann started with the Angels at short-season Salem. He got into 20 games, starting four. He had a 7.06 ERA. He moved to single-A Quad City for 1987, returning there in 1988. He went 10-11 in 27 starts in 1988. He also had a 3.06 ERA. Vann split time in 1990 between high-A Palm Springs and AA Midland. He made it to Midland by the start of July. "I thought I'd be here when the season started," Vann told The Oklahoman after the move. "But I guess it's better late than never." Overall, Vann went 3-5 between Palm Springs and Midland that year. He moved to the bullpen, getting into 60 games without a start. Vann impressed enough that year to catch the eye of the Brewers as the club took him in that December's minor league draft. "Those are the kinds of arms you look for," Brewers farm director Bruce Manno told The Sentinel that December. "We really felt he was a guy we couldn't pass on." Vann then played 1991 between high-A Stockton and AA El Paso. He had a 2.25 ERA in his 23 outings at Stockton. At El Paso, his ERA increased to 9.85 over 19 outings. He returned to El Paso for 1992, then moved to the Mets and AAA Norfolk for 1993. At Norfolk, He went 4-4, with a 3.22 ERA over 53 outings. It was his final season in affiliated ball. Vann returned for one more season, at independent Brainerd. He got 18 outings there, with a 3.12 ERA, ending his career.